That’s R B-Bop is an album by the band Pastiche, released in 1984. 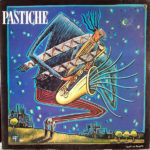 For more information about Pastiche, please visit their website here. This is a decent album. Very similar to Manatthan Transfer.